A Kingwood-area Salvation Army ringer collected a very special donation over the Christmas holiday. 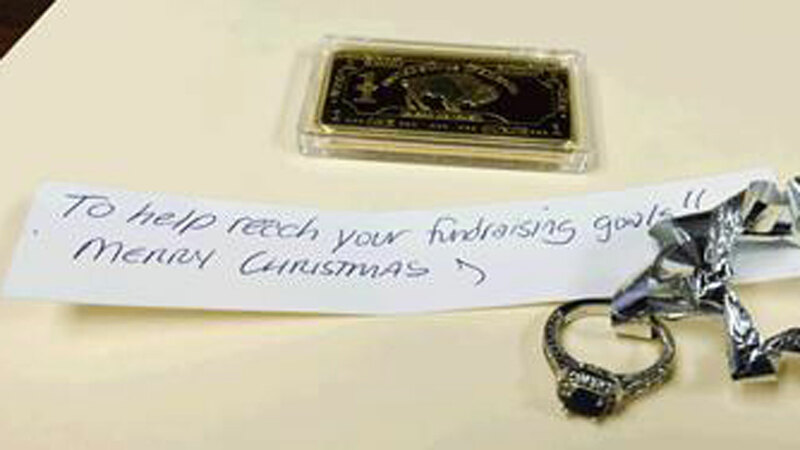 HOUSTON -- An anonymous philanthropist dropped an engagement ring into the red kettle of a Salvation Army ringer in northeast Harris County. The valuable donation is among a list of other valuables the charity says it will now use to help those in need. The sparkling ring was dropped into a red kettle on December 23 outside a Walgreens store in Kingwood. Around the ring was a note attached with a small silver ribbon. The note reads: "To help reach your fundraising goals!! Merry Christmas." A few of the season's other high-dollar donations were an American buffalo gold bullion bar weighing one ounce, and four gold coins. The bullion bar was placed in a red kettle on December 15 outside the Dillard's store at Deerbrook Mall. The four gold coins were given outside several grocery stores in the Houston area with messages about the birth of Jesus Christ. The Salvation Army says while the Christmas campaign has ended, their need remains throughout the year. Donations may be made online at SalvationArmyHouston.org.